It started, as these things so often do, with the Chiltern Seeds catalog. Their thick catalog of lust-inducing descriptions (and no pictures) arrives every winter, and I discover some new group of plants I just HAVE to try. 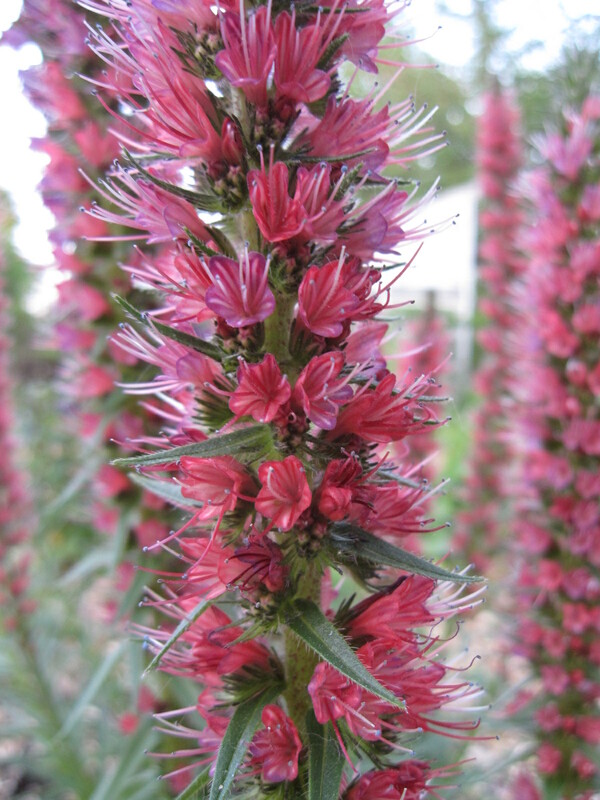 How could I pass up this description of Echium lusitanicum ssp. polycaulon? 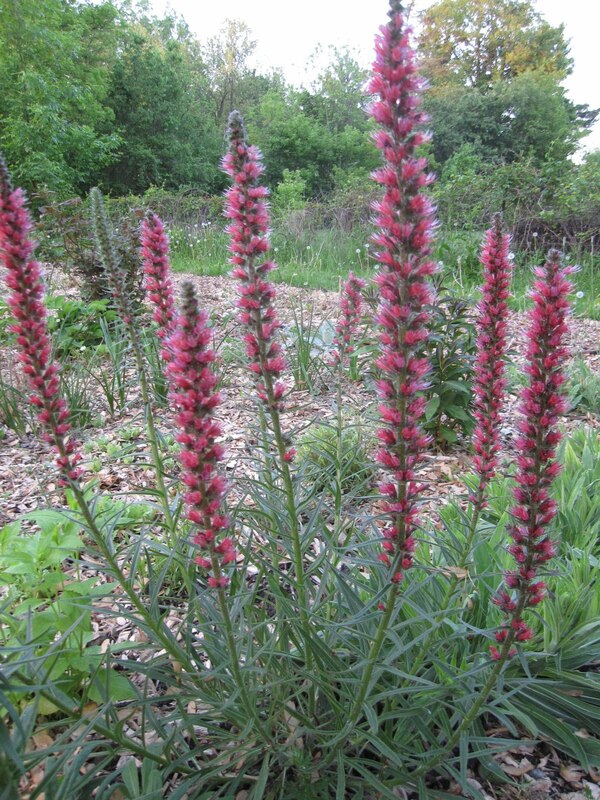 "From Portugal comes this delightful and little known plant for the border. Forming three foot rosettes of large, bristly leaves, it produces over a long period in late spring and early summer many softly hairy stems bearing 18 inch spikes of lovely, vibrant pale blue flowers with violet veins and gracefully protruding stamens. Recommended as a quality cut flower. 3 ft"
Or this, of Echium russicum? "From Eastern Europe comes this superb species producing bushy specimens with attractive, slender, pointed, white-hairy leaves, and bearing rather splendid, twelve inch spikes of bright dark red or crimson flowers charmingly garnished with long-protruding red filaments. 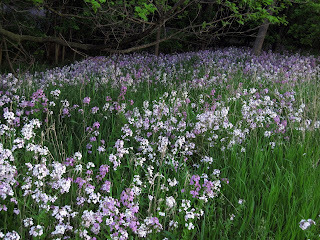 Definitely something different for the front of your borders and, although often thought of as a biennial, it will often become a short-lived perennial if it gets to like you. 2-3 ft."
So last year, I ordered the seeds (along with some E. vulgare 'Blue Bedder' and E. fastuosum). Last summer they just made little rosettes, but they over wintered, and now are showing their stuff. The plant as a whole is a little loose, but would look great in a densely planted boarder, and I'm excited to try them as cut flowers. 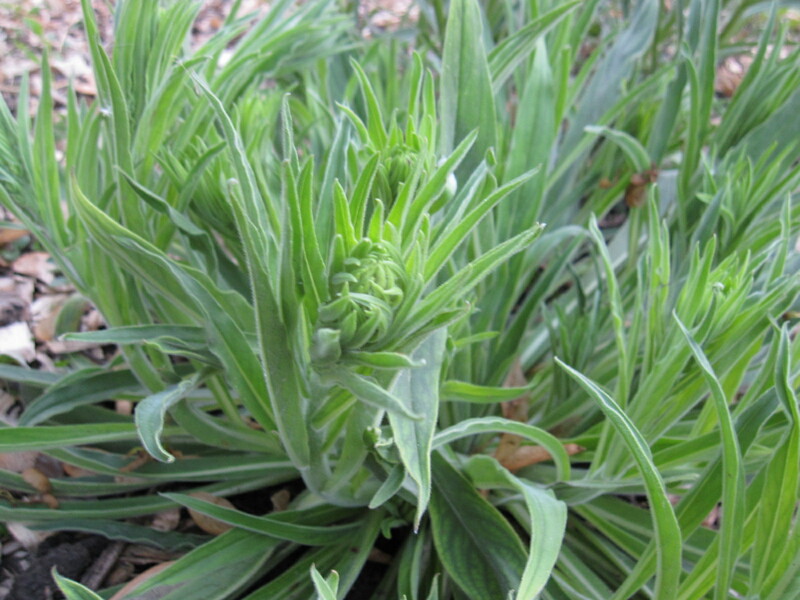 According to what I could find on-line, E. lusitanicum is only hardy to zone 7 -- but they overwintered just fine for me (though last winter was a mild one) and are just starting to send up their flower spikes. I can't wait to see them in bloom. 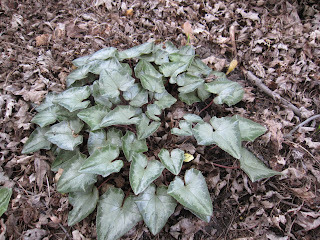 But the foliage is still amazing, and I'm hoping for flowers this year. 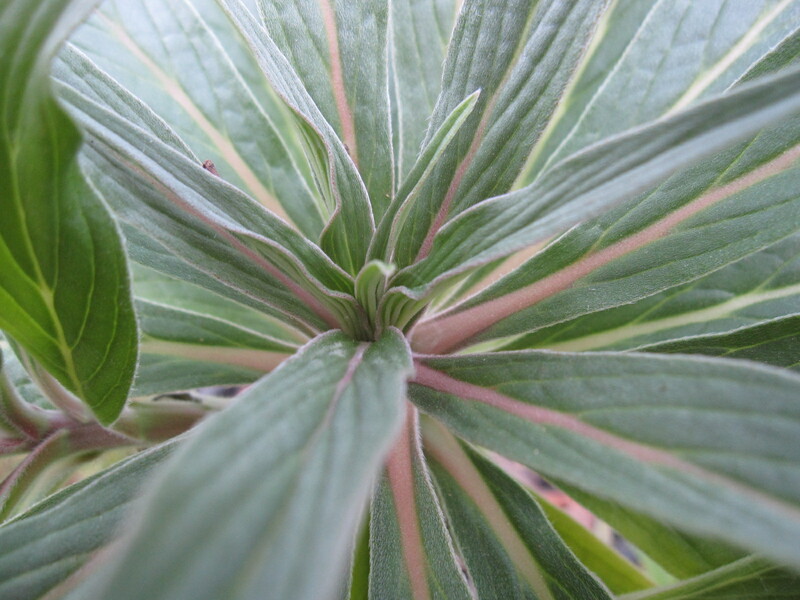 Anyone else growing Echium? I think this is an obsession that is just beginning... Chiltern offers another variety, a hybrid called 'Snow Tower' which they describe as being "almost unbelievable – an enormous plant producing an enormous avalanche of snow-white flowers. Up to 15 ft" Can you imagine? 15 FEET of echium goodness! I'm sure it will be next to impossible to over winter... I'm also sure that won't stop me from trying! 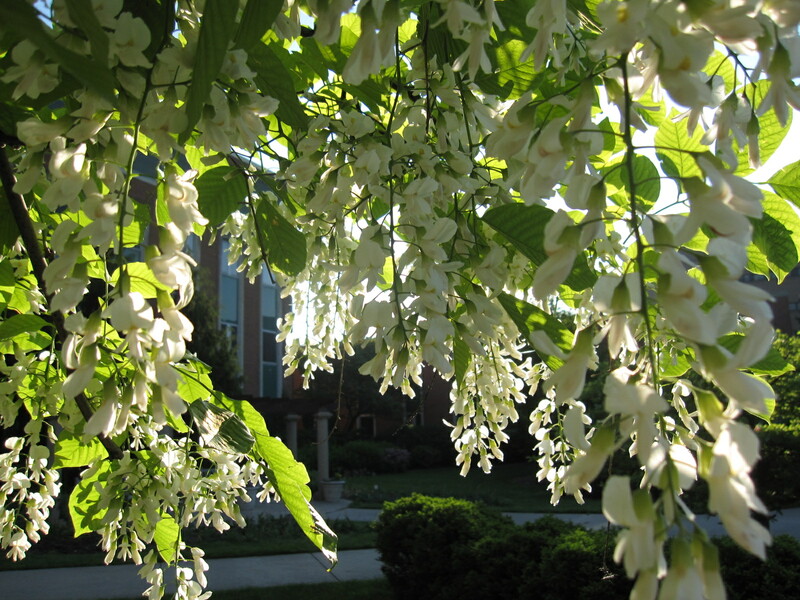 Big clusters of dangling, fragrant white flowers almost like a wisteria. Sadly, though, not everyone has the same experience with this tree. 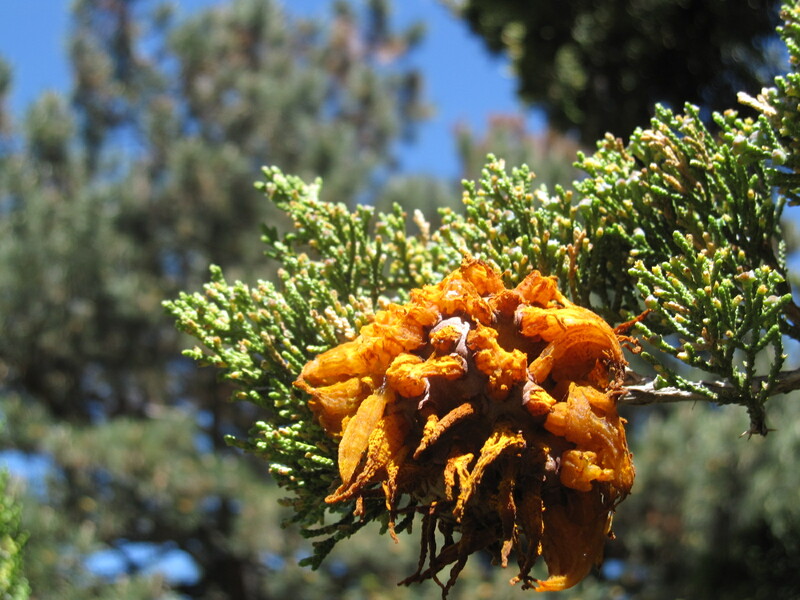 Mr. McGregor's Daughter just posted pictures of her tree, and they look pretty sad. I'm not sure what the difference is: She's in Northern Illinois, I'm in Central Michigan, both zone 5. Here the show tends to be this impressive every other year, but she says her's hasn't flower in 5 years! This particular tree is sheltered by a big building, but there are lots of them around campus, and they all look amazing. Any theories? This year, I started keeping a spreadsheet of all the new plant varieties and species I acquire in my garden so when I forget a name, I can easily look it up. This weekend I entered plant number 158 into that spreadsheet. Which seems a little excessive, but not really. After all, most of those plants I grew from seed, which is dirt cheap. The wildflowers along my daily ride into work are, once again, outdoing the best gardeners. 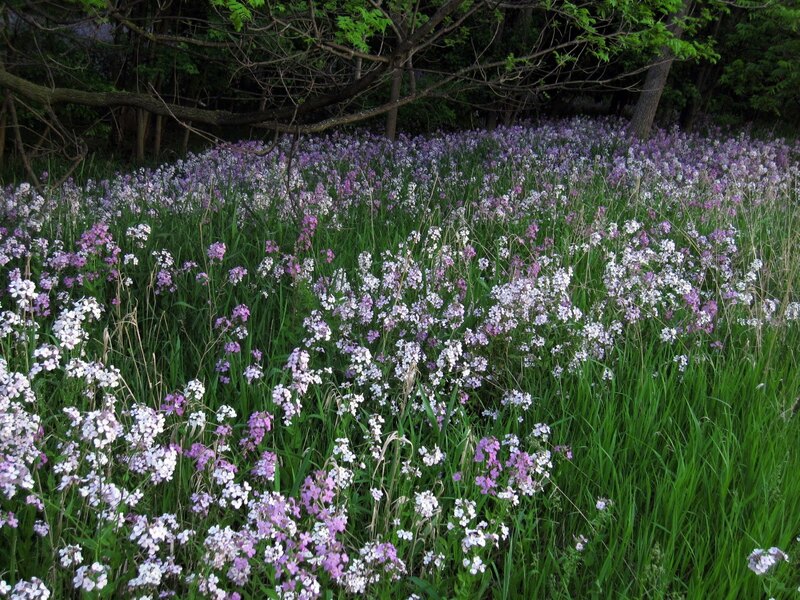 Here are a couple shots of the sheets of dames rocket (Hesperis matronalis) making parts of the woods lovely (and incredibly fragrant) right now. Before I gets lots of angry comments: Yes, I know it isn't native. I also can see it is far from forming a monoculture, as there are lots of other plants in these stands that it is getting along with just fine, and I've only seen it in large numbers in disturbed, road-side areas like this. 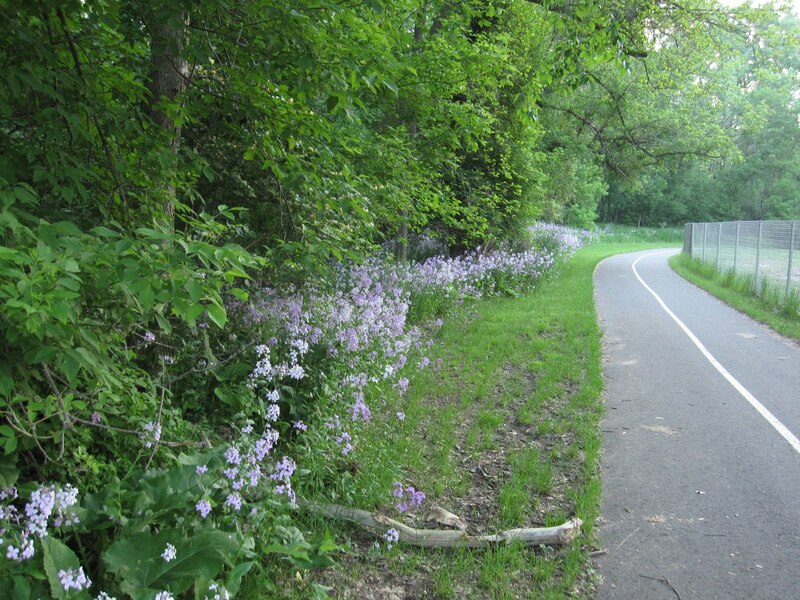 I'm certainly not going to spread it to areas where it isn't already growing, but I don't see any harm in enjoying its beauty. This is really only tangentially related to plants and gardening, but I've been thinking lately about the internet. My thinking was started by a series are articles in Slate by a man who has decided to give up the internet for 4 months. The articles are full of references to the internet as an addiction, and a time waster. His latest is titled, If You Grow Up on the Internet, Are You Better Equipped To Use It Responsibly? About how young people feel about the internet. Which got me thinking. I grew up with computers, but the internet didn't really come into my life until my late teens. And do I regret it? Not even a tiny little bit. I just wish I had had it sooner. I discovered (or, rather, rediscovered) gardening in my mid-teens. 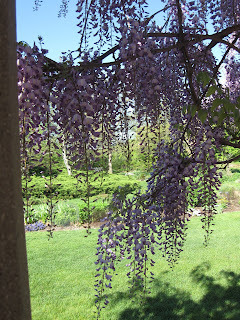 I didn't know a single gardener, with the exception of my uncle who lived 7 hours away and I saw maybe annually. I got stacks of books out of the library, and started learning to garden by trial and error. Mostly error. Then, the internet came along -- at the library, at school, and I had access to information. To people. 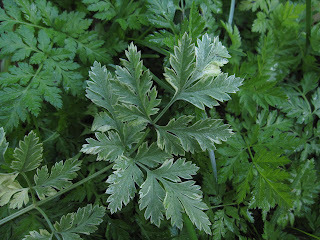 I traded plants and information with people on garden web. Most importantly, I discovered the incredible community of people that is The Rose Hybridizers Association, where I learned most of what I know about my deepest gardening passion, plant breeding. Let me emphasize that: In roughly another year I will have a PhD in Plant Breeding and Genetics. I have certainly learned a lot about the topic here in graduate school. The fundamentals, though, the real foundation of what breeding is and (perhaps most importantly) why I LOVE it, I learned from the amazing people on-line. And there is so much more... I have a small collection of great garden reference books, but I have at my finger tips the ultimate reference of all, Google. I can, in moments, learn of an incredible new species of plant, get professional and amateur reviews of it, find a source to buy it from, find out how many chromosomes it has, and virtually anything else anyone knows about it. 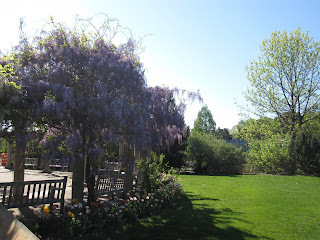 I would certainly be a gardener without the internet (I don't think anything could keep me from being a gardener) but I wouldn't be nearly as good at it. Certainly I loose a little time watching cute kitten videos on you tube, but that is more than made up by the fact that I can learn in minutes what would have taken me hours to find in the library. 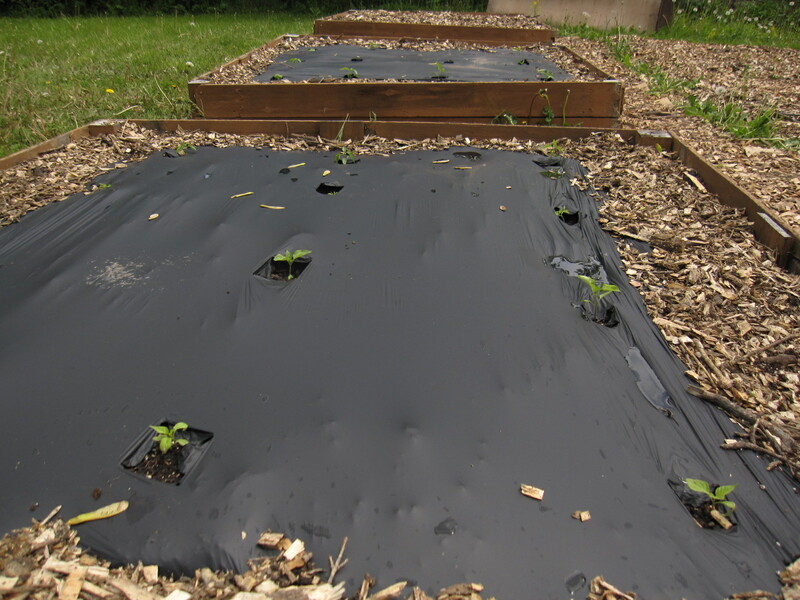 I've long known that in climates like mine (chilly Michigan) commercial production of heat loving plants like tomatoes and peppers relies on covering the soil with sheets of black plastic. 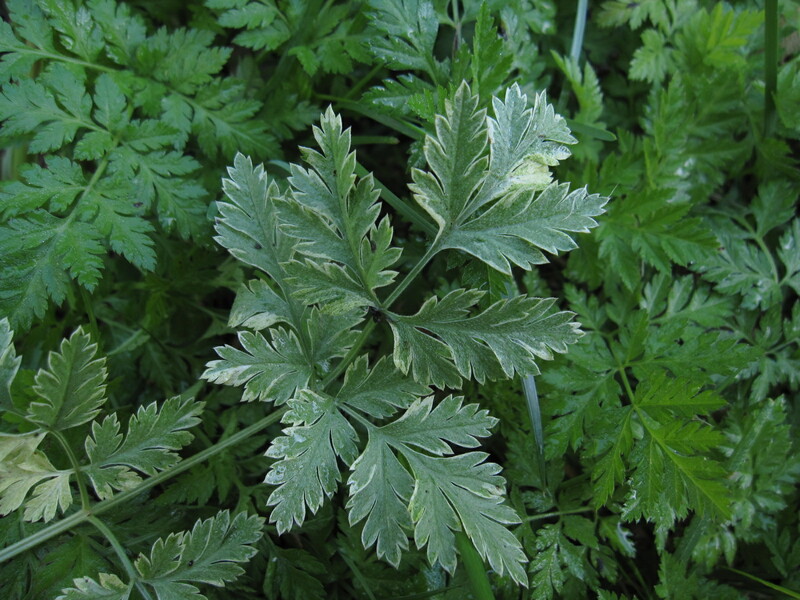 The black absorbs sunlight to warm to soil, also controlling weeds and keeping the soil moist. But I never realized just how much of an impact it has until last summer, while visiting a friend's research plot, I saw two pepper plants growing side by side, one with plastic mulch, one without. I didn't have my camera with me, so you'll have to use your imagination: The one without plastic looked like the ones in my garden -- small, straggly with a few peppers. With the plastic, the plant was nearly twice as big, lush, full, and covered with fruit. It looked like an ad for some questionable fertilizer. 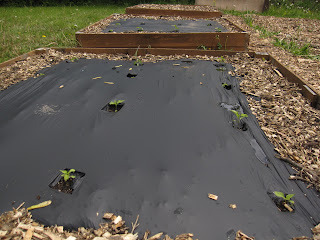 But I finally decided to give black plastic a try when I saw biodegradable soil warming mulch for sale in the Johnny's Selected Seeds catalog. 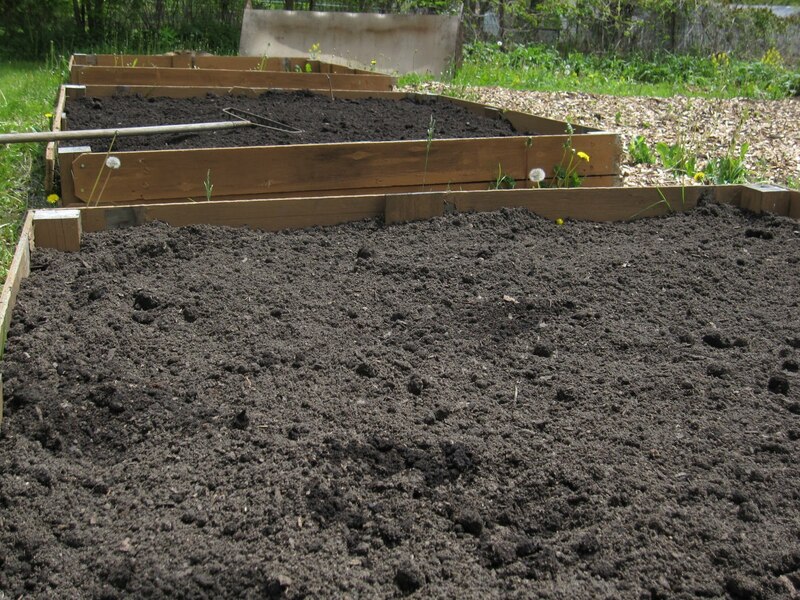 They say you can just put soil on it at the end of the year, and it will be gone by spring. The flip side, I guess, would be that it might break down too quickly. We'll find out. Yuck. After last year's dismal tomato and pepper season, I'm willing to do just about anything to ensure I have a good crop this year, but that is REALLY ugly. Those peppers better take off quick and cover it up. Virtually all variegated plants on the market are found as chance mutations in a garden or nursery -- so I always keep my eye out for leaves that look different on the off chance that I'll find something exciting. 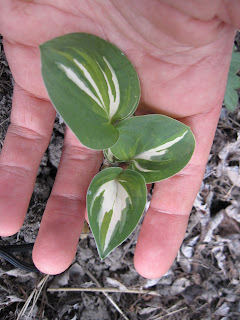 This past weekend I found not one but TWO variegated plants in my yard. Both weeds, sadly, but still, cool all the same. This variegated queen anne's lace (Daucus carota) shown here against its plain green neighbors, is actually quite pretty, I think. Sadly, it is a biennial, so the only way to propagate it would be by seed, and this type of variegation is virtually certain not to come true from seed. 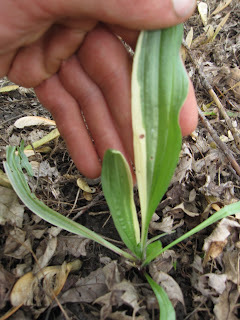 This narrow leaf plantain (Plantago lanceolata) has variegation that looks unstable -- half the leaves are variegated, half aren't, but I'm hopeful it will stabilize with white leaf margins. 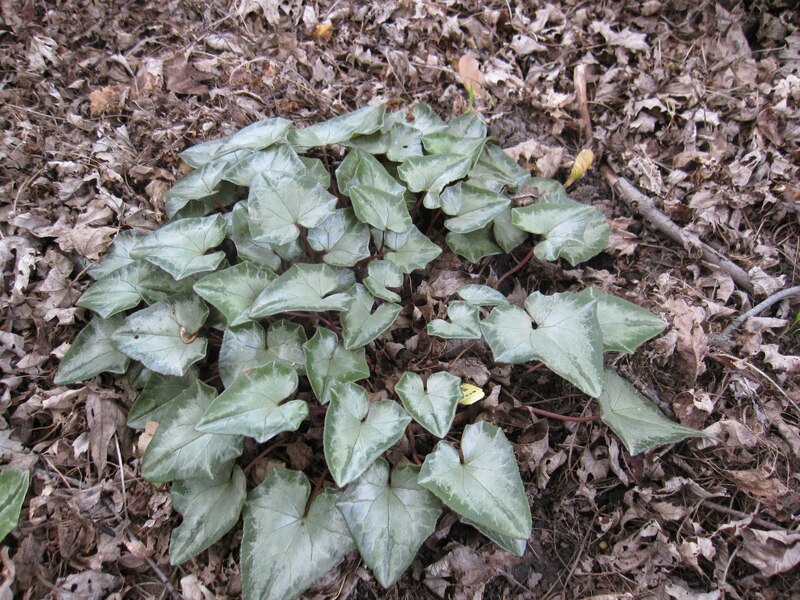 Plantain is a perennial, so propagation would be no problem, and really, it looks more like a rare and expensive hosta than a weed! Of course, it will still seed around like a weed, and have plain, green children... but still. Pretty cool. 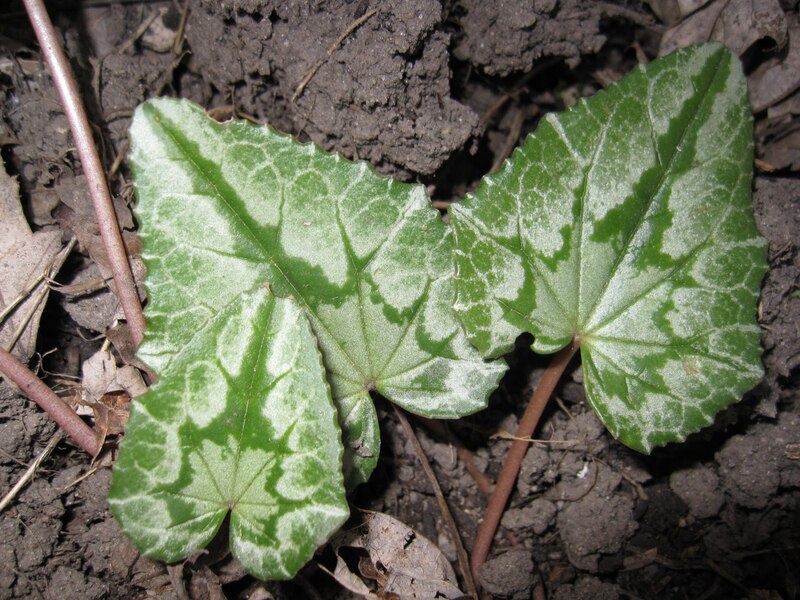 Now if only the non-weed residents of my yard would follow their example and throw variegated sports as well I would be REALLY excited. Kinda gross, but kinda cool at the same time. 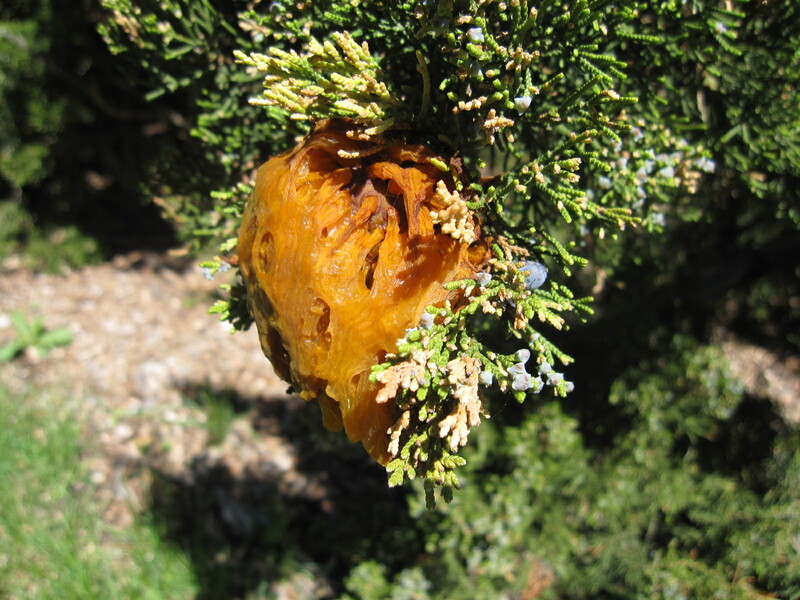 Turns out it is Cedar Apple Rust -- a fungal disease that can grow on apples, hawthorns, and junipers. On the apples and hawthorns, it can cause serious damage, but doesn't do much more than look funky on junipers. More info here from Kansas state university. 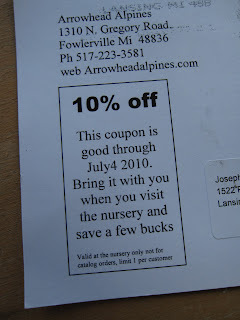 I took what I try very hard to make my annual trip to Arrowhead Alpines recently. By which I mean that I try very hard to go ONLY once a year, because I have yet to go without my bill somehow mounting into three figures. And that isn't because they are expensive -- prices are quite reasonable, they just have SUCH amazing stuff I can't resist. If you don't know Arrowhead, you should. 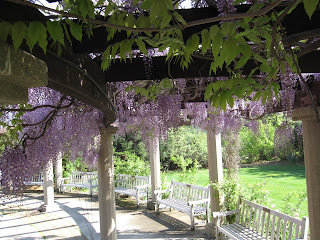 They are one of the great specialty rare plants nurseries in the US. They do mail order, so no matter where you live, you've no excuse not to browse their wonderful catalog, especially if you live in a cold climate. Unlike the tempting (but rarely hardy in Michigan) Plant Delights Nursery, Arrowhead is smack in the middle of zone 5, and their selection of plants for this climate is amazing. They have hardy versions of typically tender plants like agave, agapanthus, and gazania, and all kinds of other cool stuff. This year I sampled some of their amazing primrose selection. Below are two of the Primula xpubescens 'Gigantea Select' I picked out. 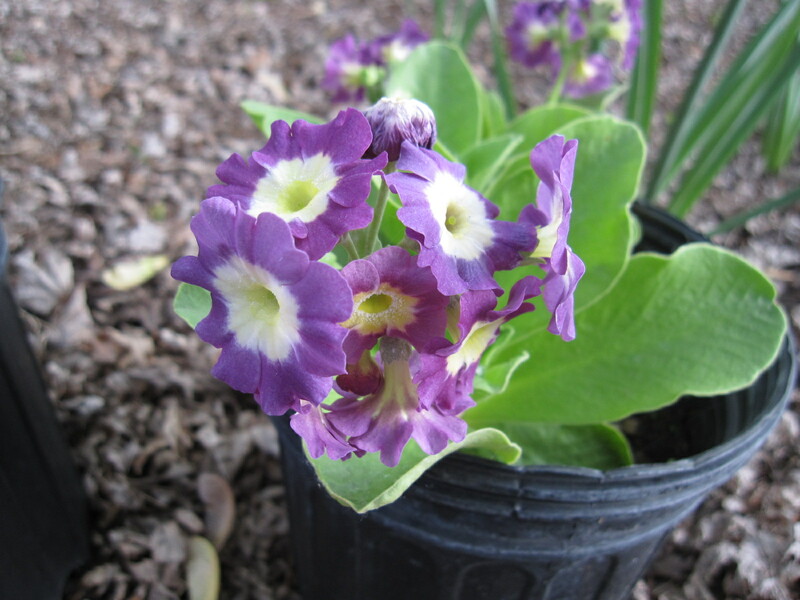 Their catalog says "Perhaps the best primula for Midwestern gardens, they laugh at summer heat, flowers are huge in a wide range of colors." With that recommendation, and these colors, how could I pass them up? If these perform as hoped, I'll be getting many more. I also discovered a hosta I actually like! Like so much I couldn't pass it up. This little charmer is 'Pandora's Box' I bought a little pot, and easily pulled it apart into 20 (yes 20!) 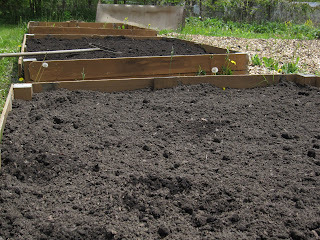 little divisions, which I spaced out to form a low mass in the front of the shade garden. They look a little sparse this year, but they should fill in next year. The plants I got are small, but the one I got from them last year has already grown into this spectacular clump. 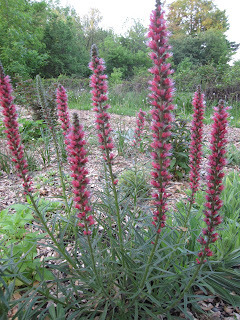 I'd grow it for the leaves alone, but they also are topped with a mass of fragrant pink or white flowers in the fall. 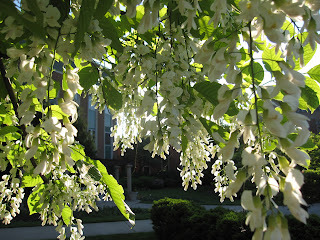 Sure beats hostas! They have a mind-boggling array of Sempervivum (I've never counted, but I think there must be over a hundred varieties listed in their catalog, and more at the nursery itself) which are so charming and so easy I never leave without picking up a new one. 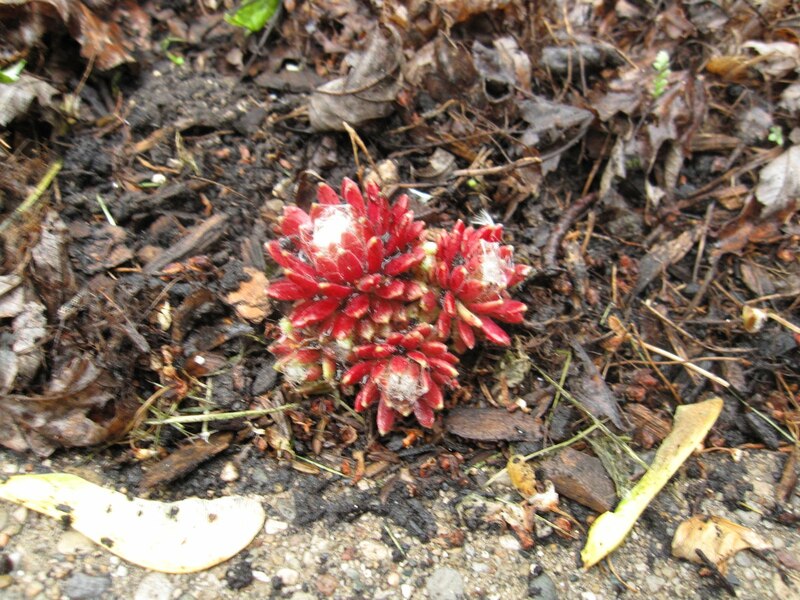 This time it was this bright red variety called 'Mona Lisa.' I can't quite believe the color! I wonder if it will hold all summer? I got oodles of other things... a hardy cymbidium (yes! I'm not kidding! 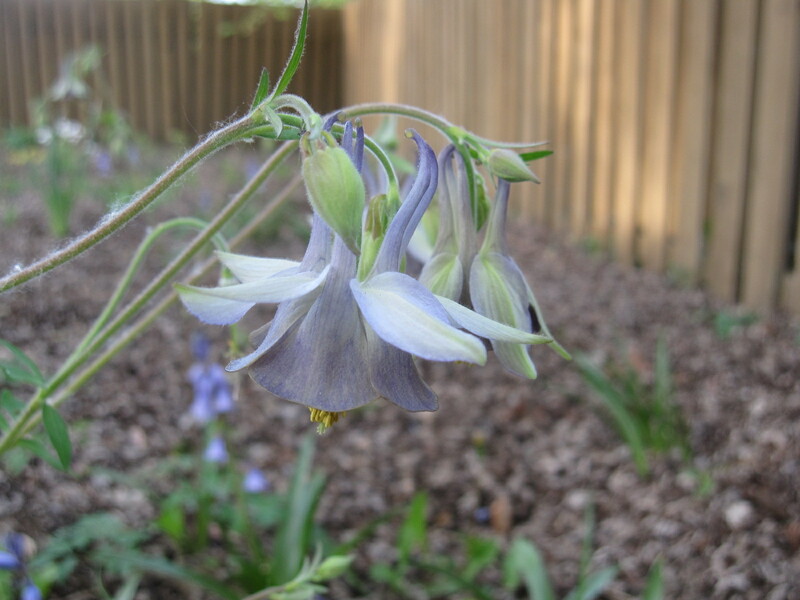 ), lots of campanula (I've finally promised myself I will stop ignoring that genus) and so much else -- but none of them are flowering or looking pretty at the moment, so I'll save them for another day. I'm also trying to talk myself into going back... there are geraniums I wanted, and... well, we'll see. Starting off, an odd little story from The Hindu newspaper about the potential for growing a particular variety of strawberry in space. 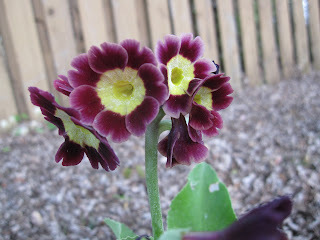 I pass this along in case any of my readers garden on the international space station. Carol, over at May Dreams Gardens, has been talking about her columbines, which makes me want to talk about MY columbine. I'm a big columbine (Aquilegia) fan for several reasons. 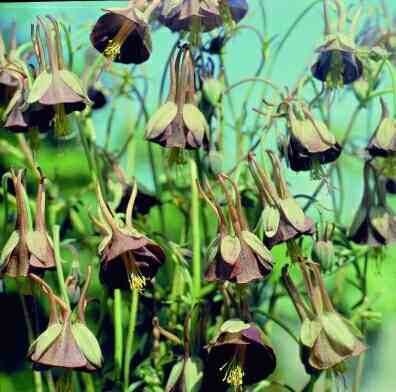 They're easy and adaptable, have gorgeous intricate flowers, and are one of the few groups of plants that can do the whole range of red, yellow, blue and everything in between including brown, (almost) black, and green. Most of all, though, I love their promiscuous, self-seeding ways. 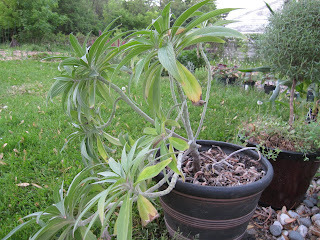 Regular readers may be beginning to realize that I am sort of obsessed with breeding plants. With most plants, you have carefully pollinate, then collect and grow seeds to get hybrids. 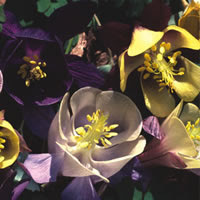 But with columbine, just plant two varieties next to each other, and they'll do all the work: bees and humming birds will carry the pollen, and they'll seed the hybrid offspring around without any help from you. So, each year, when a new crop of seedlings comes into bloom, you just get to look through them and pick your favorites to let seed next year. This one is, I think, a cross between 'Perfumed Garden' and A. viridiflora. The color is a little washed out, but the SCENT! It combines the honeysuckle smell of 'Perfumed Garden' and the fresh, herbal smell of A. viridiflora to great effect and is so strong I notice it just walking past. 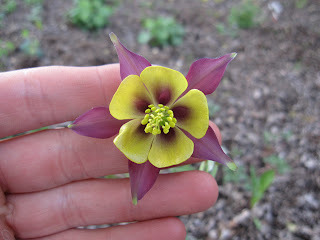 I hope some of the next generation keeps the fragrance, but has brighter colors and more of the shape of A. viridiflora. 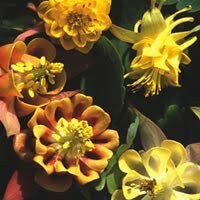 This one combines the color of 'Oranges and Lemons' with the shape and scent of A. viridiflora. This has got to be one of the most elegant columbine flowers I've ever see -- such a sophisticated combination of yellow and purple-red, and what a perfect shape! I hope this one messes about with its more fragrant half-sister above, so I can combine these colors and perfect form with an even stronger, more wonderful scent. By the way: If you are interested in growing more interesting, fragrant columbine next year, DO check out the selection from Plant World Seeds. 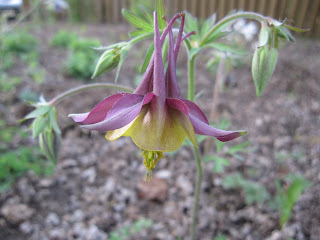 They have a mind-boggling array of columbines unlike anything I've seen anywhere else. They are a UK company, but they ship to the US, and are well worth your time. Makes you want to rush out and buy one, doesn't it? 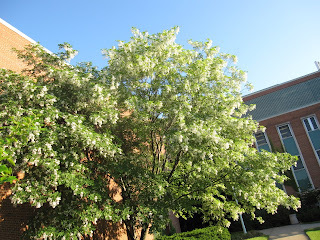 I was talking about it with one of the faculty who has been here a while and he said he felt like he'd been waiting 20 years to see a display like this from that vine. 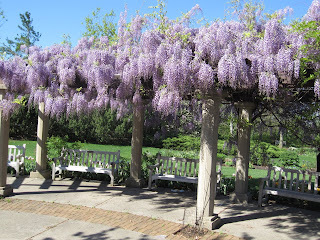 The fact is, while wisteria is glorious they take a while to really settle in and get blooming. The moral of this is, of course, to go plant a wisteria RIGHT NOW so you can get to the amazing display as soon as possible. The Scientist gardener post about "Hybrid Heirloom" tomatoes -- tomato varieties bred to combine the vigor and disease resistance of modern hybrid tomatoes with the flavor and quirkiness of heirlooms. Also check out his post on a possible new short cut in apple breeding. The New York Times does a story on Tony Avent of Plant Delights Nursery. Not an amazing article, but I'm always happy to see any gardening news in the NYT. 1 in 10 Britons have been injured while gardening. 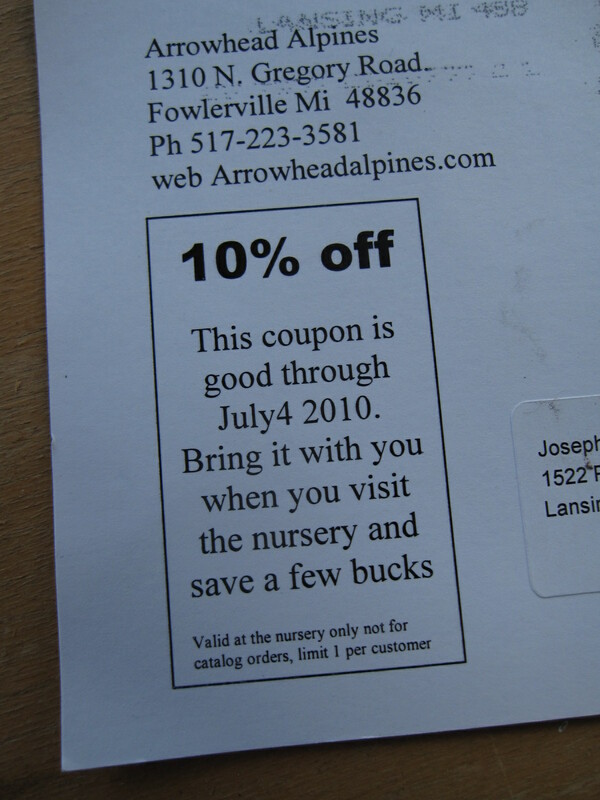 I'm willing to bet less than 1 in 10 Americans have gardened period. The Galloping Gardener asks: "Where would we garden lovers be without the NGS?" To which I answer: America. We need a good national gardening scheme for this nation.